British journalist and writer, Harry Hodgkinson (1913-1994), walked from Charing Cross in London to Damascus Gate in Jerusalem in 1936. The next year he visited Albania, fell in love with the country, and joined the Anglo-Albanian Association upon his return to England. 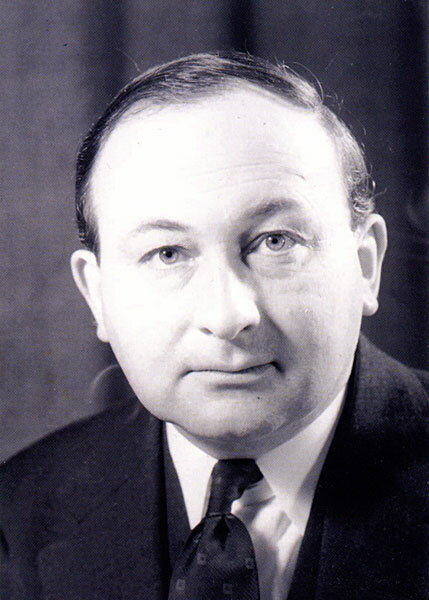 In 1942, he joined the Royal Navy as an intelligence officer with special responsibilities for Albania, and operated in Yugoslavia and Albania during and after the German occupation. As a member of the so-called “Balkan Air Force,” Hodgkinson spent a fortnight in the Vlora-Saranda area in November 1944 and a week in Vlora, Durrës and Tirana in April 1945, and was well in touch with Albanian affairs through personal contacts. This well-informed report on Albania was submitted to his superiors in April 1945, five months after the communist takeover, when Albania still had no proper government. The most misleading thing in Albania at the moment is the large illuminated red star on the hilltop palace above Durazzo. To anyone arriving by sea, it suggests a country given over to communism, with equality and hard work as the order of the day. The fact is, though, that the gap between ruler and ruled is as great and the amount of laziness a good deal greater than at any time during the past twenty or thirty years. Whatever be politics, Albania is slipping back socially to the times of the lackadaisical Turk. For the Partisan Movement, to maintain itself in power, has conscripted something between fifty and a hundred thousand men out of a population of a million and given them the right to carry a rifle and despise manual work. Though the nearest fighting front is about 300 miles away and armed opposition to the Partisans is reduced to a meagre handful of resisters in the mountains, the streets of Tirana and Durazzo bristle with weapons. Awed and proud at being in a large town, peasant lads slouch along in ill-fitting uniforms, carrying their rifles everywhere. Boys of twelve and fourteen carry cocked and loaded Sten guns. All walk up the main street, down it, and so ad infinitum, showing themselves off one to the other, preening themselves on their new privileges. For centuries the Albanian tended to think it natural that he should carry arms and do no work. These were points of national and masculine honour. They had both to be broken if Albania was ever to be made a peaceful and up-to-date country, and a beginning was made on breaking them between two wars. Rifles, though more precious than wives, were taken away, and children were sent to technical schools to learn that there was no shame in knowing how to work machinery or grow better strains of crops. That reform has now gone to the winds. Thousands of country people are content to know that Enver Hoxha has given them back their weapons and lets them eat without toiling for their food. Sooner or later, if the Hoxha Government is going to get any serious work done, it will have to start disarming these men, stop them playacting and give them jobs. Whether it will have the courage to move against the people it relies on for support is open to doubt, for the mentality of the Old Turk is springing up in high places. It shows itself in the widening gap between public profession and private practice. Thus, there may be starvation in the hills, and there may not be much transport to take food to the people who need it, but somehow there is enough transport to convey trout from Lake Ohrida to the kitchen of the Hotel Dajti in Tirana and the thought of starvation does not take the edge off the appetites of members of the government who – like those earlier autocrats, the Emperors of Byzantium – relish this discreet and succulent fish. The trouble is that nobody is doing any work. Certainly, there is no little fuss at Durazzo about getting the port in order for relief supplies and trade. The port Commandant explains that a labour gang has been set to work and that the schools are each sending squads of children to help in reconstruction. It all sounds friendly and encouraging. But the labour gang, on the two occasions it was seen, was either playing cards under the wall or marching up and down the blasted docks singing military songs, while its leader beat time with a whistle. The only useful jobs – done by a dozen or so Italians – are making a stone track through the rubble from a wooden jetty to the port entrance, bricking up doorways in a warehouse and extending the electric wiring from the town. It is in this context that the port Commandant blandly says: “Tomorrow we shall have glass in the warehouse windows. Don’t worry, we have plenty in the town.” Tomorrow has not yet come. The same story is seen in Durazzo town. There is not a single Albanian to be seen doing any job of public reconstruction. As always, there are shops in profusion and the owners sit around in them with friends, waiting for the rare customer. They drink coffee (ersatz), complain of business and then go to the café for a game of backgammon. Up and down march the Partisans, showing off their arms. On the kerbstones sit the dejected and ragged Italians whose only hope is to get back home, to shake from their tattered shoes the dust of a crumbled empire. The road from Durazzo to Tirana is again an education of the same kind. A couple of years ago it must have been a delight to drive on – a wide smooth, asphalted autostrada as good as any the Italians built for themselves. This will be the main artery for relief coming in through Durazzo, but it is falling to pieces and nothing is being done to save it. Innumerable potholes slow down traffic and shake up cars and passengers, and a series of heavy loads will soon make it unrecognisable. Yet in this area there is labour in plenty. There are about 2,000 ragged Italians living in a camp on the very roadside, eating out their hearts for lack of some work to earn food and a little pocket money. There are the countless able-bodied young Partisans. The Partisan Government has had five months to save this major artery from decay. In all that time they have not even managed to remove the burned-out shell of a motor bus which was shot up while on its way to Tirana and still lies rusting where it stopped, an eyesore and an obstruction to traffic. The footpounds of energy needed to clear this eyesore must have been used up a thousandfold in all the congresses held month after month to explain what the Government intends to do; in all the football matches (the Government allows its team to lose 5-2 to Belgrade without rancour 7-0 – against Albania as one anti-Hoxha wag expressed it – but it will not meet a British team until assured beforehand of victory); and in the hundred and one theatre shows billed under the modest title of ‘Partisan heroism’. Hoxha has made a speech in which he visualised Albanian troops sweeping up the road to Berlin, and yet they can’t even sweep up the road to Durazzo. Lack of materials is the regime’s perennial excuse, but somehow valueless jobs that feed the regime’s prestige manage to get done – a public memorial at Valona, perfectly carved names on bank buildings and – at a time when thousands are homeless, the erection of a large hall in Tirana for a youth congress. The discrepancy between needs and achievements was to have been expected. The Partisans fell victims to their own propaganda and were flattered by ours. They began to think what fine fellows they were. They really supposed that in the XXth Century they could run a government having for Vice-Premier an illiterate whose only claim to fame before he joined their movement was the murder of a man who had stolen his beloved white mare. That they could manage with a Finance Minister who says without irony: “Of course I know nothing about finance; but the people will decide”. Secure in their own good opinion, they have proceeded to exile, shoot, imprison or threaten into oblivion thousands of non-political nationalists whom any Albanian government needs to carry on the day-to-day job of running the country. Along with the handful of scallywags who were cut and cut Quislings, they root out potential opposition and intimidate the neutral. Such obtuseness is doubly unfortunate, for Albania could well dispense with many politicians for the sake of a few first-class technicians. Her salvation at present would be a Keynes with something of the powers of a Prime Minister. Her immediate economic possibilities have nothing to do with fascism, capitalism or democracy, but with plain common sense. In the mountains, for instance, people lack clothes and have been shivering through a winter of Partisan rule. In Durazzo and Tirana the shops are bulging with cloth which will never be sold because stocks were built up at a time when Albania was acting as clearing house for Greece and Jugoslavia, and for a long time ahead the home market will not be rich enough to absorb them. The mountaineers shiver, the cloth lies unbought and unbuyable and the shopkeepers drink coffee and talk. One does not need to be a communist to suggest that the Government should buy up these white elephant stocks against an issue of bonds and distribute the cloth to its representatives inland. The same applies to a whole range of goods, including a mass of household appliances that would make the shops of Tirana and Durazzo appear an El Dorado to the average housewife suddenly put down there from the U.K. Instead of skimming off surplus goods from the shops and using them for relief, either openly confiscating them or paying for them out of taxes or a loan, the Government has begun a capital levy. Large businesses are assessed for ‘war profits’ and are ordered to pay immediately a levy which in some cases is larger than the alleged profits. The aim is to impound the assets, and it succeeds. Many of the larger shops have already gone bankrupt. The Government has succeeded up to a point, but it has convicted itself of legalised theft, raised up much ill-will and future opposition and helped to dislocate business without itself having the organisation to takeover the ruined firms. By this means the Government hopes to force into the open suspected private reserves of gold, failing to see in its avarice that what the country most needs at the moment is free circulation of consumer goods, not the collection of barren metal, and that once confidence is restored, private hoards will come out in the normal course of affairs so that they can earn more wealth. In the country, the peasant is ordered to plant and work his fields as never before, but his sons are conscripted for the army. They are then billeted on some other peasant, where they loaf all day with their rifles, while the other peasant’s children are conscripted and billeted on him. It is not unusual for ten soldiers to be so billeted on a single farmhouse, so that the farmer has to produce more food with most of this labour force gone. As for food in the towns, meals are served at the modern, Italian-built Dajti Hotel which makes wartime Ritz cuisine look like a corner house. A party of half a dozen receives – this is day after day; there is no special festivity to account for it – a plate of hors d’oeuvres as big as a coffee table top. Follows Ohrid trout and then a choice of lamb cutlets, steak, asparagus and eggs. Cream cakes and fruit then sustain the more earnest appetites. Thus reinforced, officials then discuss the whys and wherefores of relief for their starving country. It is a state of affairs which would not be tolerated in a so-called capitalistic country. The only justification offered is lack of transport and lack of communications. Fifteen hundredweight trucks cannot run all over Albania because destroyed bridges have not yet been repaired. What of it? The roads themselves have not been in existence for more than a few years. Before that, goods were carried on the backs of donkeys and even on the backs of men (or, more often women). So they could be again. One mule train, for example, could carry enough cloth to make suits and dresses for a whole cluster of villages. Foreign trade has certainly begun. Of the ten tons of petrol produced every day in Kucova, five are being exported to Jugoslavia by sea, in return for wheat. But here again the old Turkish mentality comes out. Kucova is producing because after the Germans had destroyed it, an Italian engineer, with an Albanian assistant, got it back into working order. Once this was done for them, the Government shot both men on some pretext or other and sent a Minister to the microphone to say how wonderful it was that the Partisans were once gain producing oil. The Hoxha Government professes itself to be strongly sympathetic towards Communism and the Soviet Union, but it hasn’t even learned the lessons which have come naturally to capitalistic nations during the present war. In its mingling of bombast, fine paper plans, cunning and simplicity, its system of spying and talk of liberty, its lust for rifles and gold, it is neither a democratic nor a Soviet body – it is a handful of bashibazouks with red stars on their fezzes. Hoxha complains that his Government is not recognised by the Allies. The short answer is that he does not possess a Government to recognise. Whether the majority of the people support him or not is more than problematical. It is also irrelevant. For even if they do, the administration existing at present has not the human resources to carry out the functions of modern government. Not only are most of Albania’s educated people and technicians dead, jailed, exiled or cowed, but the Government has not been able to find among its faithful even one representative in Durazzo who can speak English. While the LCIs and LCT were there, and ML was beginning to establish itself, understanding depended on the chance presence of some officer or other who knew Albanian or Italian. The Government officials insisted that everything concerning the port should be discussed with and answered by them. The only drawbacks to this arrangement were: first, that none of them knew a word of English; second, that none of them knew a thing about the port. This is perhaps understandable in view of the fact that the Albanian counterpart of the First Lord of the Admiralty is a young gentleman aged 19, whose precocity is equalled only by his lack of naval knowledge. It was he who undertook negotiations leading to the sweeping of Durazzo harbour; he who took the decision that a line could be swept for one ship from the harbour entrance to the berth which he in his wisdom had decided was the right one. It is recounted that his reluctance to allow more scope was overcome, not by negotiation, but by the sense of well-being and indifference induced by his hospitable reception on the sweepers. The difficulties likely to arise for the Navy in the use of Albanian ports are illustrated by the experience of the Recce Party MSU 5. The party arrived in LCI 108 on the morning of St. George’s Day. The first reaction noticeable ashore was that the sentry at the foot of the jetty was joined by three small armed figures who mooched towards the newly arrived craft, their faces a study in suspicion tempered with awe. They asked to speak with one of her officers. No. 1 of the LCI and the CO of the party obliged. There were salutes, handshakes and introductions, after which the leader of the Albanians produced a small slip of penny notebook paper and asked whether the people whose names were written on it had arrived with the ship. The names were those of the recce party, perfectly spelled. It was agreed that they were all present. “They must go back to Italy immediately,” said the Albanian. As 108 had hove to all night outside Durazzo in a heavy sea and under a stiff southerly wind, the prospect was not relished. It was explained that the arrival of the party was covered in the agreement signed by the Albanians and that notice of the names had been sent in by the Albanian Mission in Bari. The magic word which ended this impasse proved to be “Tirana.” It was enough to say, “We will go to Tirana and see about it.” The effect was like telling a timid child that you will fetch the policeman. The guard insured himself against a decision either way in the capital by implicitly withdrawing his ultimatum while at the same time seeking an assurance that the party would not come ashore until the question had been settled. At Tirana, ML discussed the recce party with the authorities. “What are they here for?” asked they. The answer that they intended to take soundings inside and outside the harbour was met with incredulity. “Why? There is plenty of water. It’s deep enough for anything. Look at the large ships there already.” – these being the LCIs and the LCT. Whether the name put them at ease, or whether they did not want to admit they did not know the draught of a Liberty Ship will never be known. But they promised to give an answer next morning. Meanwhile, unknown to anyone, they rang through to Durazzo and ordered that MSU 5 should be allowed ashore and given every facility. This innocence of all matters naval on the part of the Albanians, coupled with their strong sense of national pride, may prove the main obstacle to smooth working of the ports. At both Durazzo and Valona knowledge of the harbours – and a detailed knowledge, freely available to our people – is in the heads of a handful of non-Albanians. They in turn are regarded with suspicion by the Albanian authorities, who see in their conversations with British officers a veiled threat to their own prestige and perhaps the beginning of a conspiracy against the Hoxha regime. In one field at least there is no lack of activity. The printing machines are immensely active, turning out propaganda in favour of the Government. The official GAZETTE, equivalent of the London Gazette, is still continued, but the principal newspaper is the Tirana daily BASHKIMI (Unity), also an official Government organ. The other newspapers are run by the various FNC [National Liberation Front] Committees in different Prefectures – for example, PERPARA (Progress) in Korca, JEHONA E TIRANES and ZERI I VLORES (The Voice of Valona). These newspapers are of four pages each, with general and local news, political and cultural articles, occasional poems (such as those the Minister of Propaganda writes on the Kremlin under a pseudonym) and a small amount of advertising. The newspaper press is thus completely in the hands of the FNC. Papers are not merely subject to censorship by the party in power; they are the organs of the party in power and of no one else. The magazine press is equally controlled by the FNC. Two of the leading new magazines are SHQIPTARJA E RE (The New Albanian Woman), organ of the Albanian Women’s Antifascist Union, and BUJKU I RI (The New Peasant) which began publication in February as the organ of the Ministry of Economy. This is the most ambitious magazine yet to appear; it has 40 pages of economic news, government decisions and plans for the land. The frontispiece to No. 3 (April 1945) manages, however, to make an ingenuous comment on the topsy-turvy economics of the new regime. It shows a solitary ‘new peasant’ ploughing his land – still, poor man, using oxen and apparently the old wooden plough – while on the mountains behind him no fewer than ten armed soldiers leap towards the background to protect him from enemies who are by now non-existent. In addition to the periodical press, booklets and pamphlets have now begun to pour out, again from the Government press. Among the more recent are the 74-page report of the First Congress of the Women’s Antifascist Union, a history of the First Brigade by Major-General Mehmet Shehu, and a series of speeches by FNC leaders. Of the latter, two have so far appeared – Enver Hoxha’s speech last Independence Day 28th November, and one on war criminals by Koçi Xoxe, Minister of the Interior. Apart from official literature of this kind, the only new reading matter available in Albania are the PWB weekly MUNDIMI and a United States illustrated magazine of which only one number has so far appeared. Allied literature is vetted by the Ministry of Propaganda, so that nothing appears on the bookstalls which has not originated in or been approved by FNC. The Italians continue to have a very unpleasant time in Albania. So far as this concerns former military personnel it is due to lack of thought rather than ill-will. Those Italians who joined the Partisans after September 1943 are treated as equals. They have a committee to watch over their interests. They have Garibaldi clubs in Valona and Durazzo, from which the tricolore can now be flown, and they publish their own newspaper L’UNIONE. Many of them carry arms, and can be distinguished from the Albanians only by a tiny red, white and green favour in front of their caps. Italians who did not join the Partisans also roam about in comparative liberty. 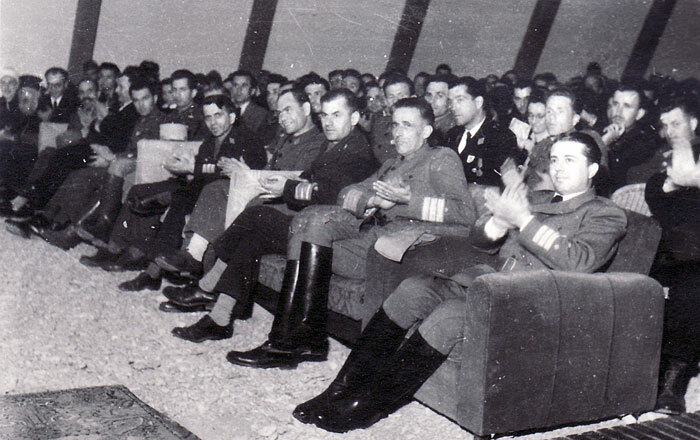 There is no racial feeling against them – in the ballroom of the Dajti Hotel the Italian flag hangs side by side with those of the Allies – and apparently no wish to have any easy ‘revenge’ on them for the invasion of April, 1939. These people, however, have been and are undergoing a martyrdom. In many cases their uniforms and boots were taken from them and given to Albanian soldiers, leaving them to find what covering they could for themselves. Hence they are a tattered mass of rags, often with paper or cloth for boots. They live in over-crowded barrack areas and are underfed, and they lack medicines to deal with the results of such conditions. There are many deaths from under-nourishment and general neglect. Added to which, there is a lack of any public works scheme which would employ them usefully and take their minds off their present condition. The result is that they mope around, getting steadily more demoralised, and – a bad sign for a future Italian democracy – becoming convinced that they have been betrayed and then forgotten by their motherland. It is not unusual to find men who have been in the Army for the past 12 years, during which time they have seen their wives and children for a matter only of weeks, or months at the most. Italian business men have an even thinner time than the military but, like them, want to get back home as quickly as may be. Though physically better off, the civilians live under a constant threat. If their business is large, a commissar is attached to it, ostensibly to report on its progress, in practice also to act as spy on the family’s doings. An armed Partisan will be found patrolling nearby, and when a visitor goes to the family’s house, the telephone is likely to ring with a request to know his name and business. No commercial move can be made without reference to the commissar, and the proprietor is liable to find himself in jail for a month at a time with no reason given. The real reason is no doubt that his spirit should be broken, that eventually he should wish to clear out, leaving his assets behind him. The method certainly works, and a number of Italian business men would gladly leave every stick and stone behind him if they could again reach Italy with a whole skin. Does the Hoxha Government, then, have popular support? What can certainly be said is that its convinced followers, who will back it through thick and thin, are in a very small minority. Though describing itself as a national movement, it in fact came to power as the result of an armed coup d’etat made possible by favourable political circumstances. FNC did not throw the Germans out of Albania. It took advantage of their evacuation to fight a number of minor actions which would show it off in the role of the only national and patriotic movement. It did not welcome either rivals or allies, and when in September, 1944, Balkom [Balli Kombëtar] attacked the Germans in the Tirana area, FNC did not welcome as an Ally the party that had been its most serious competitor for power. It turned on the Balkom forces which were caught between Germans and Partisans and decimated by the two together. In this, as in all its later actions, warfare was undertaken for a political rather than a military end. FNC now stands roughly where the Russian Communists or Kamal Ataturk stood in 1919. Its problem is to identify its organised force with national aspirations; to grow from the military dictatorship it is to the popular reforming movement it professes to be. The first obstacle will be in getting people to accept the loss of Kosovo, which has been Albanian since 1941. One of the strongest Balkom arguments against the Partisans was that their victory would involve handing back Kosovo to Jugoslavia as the price Hoxha would have to pay for Tito’s support. A recent speech of Tito leaves no doubt that this will happen. The Partisans themselves are quiet over Kosovo, but to silence criticisms of Tito’s fait accompli they have begun to whip up sentiment against Greece, discovering atrocities among the Albanians living in Çameria. From the report of a British officer and from a number of refugees who have now arrived as far north as Kruja, it does appear that General Zervas’s forces carried out some destruction and killing in Albanian villages in his area, though with what provocation is not known. This is proving a godsend to the Hoxha regime. There are bloodcurdling notices on street walls, over the radio and in the Press. The ‘Greek Atrocities’ kill several birds. They direct national feelings against Greeks rather than Serbs; they show that Right Wing politics (i.e., anything that does not wholeheartedly accept Partisan rule) means trouble for Albanians; they implicitly single out Great Britain as the reactionary bogeyman in the background; they cover up the implications of Tito’s speech. For if it is true, as the Marshal said, that it will not matter in the future whether an Albanian lives in Jugoslavia or Albania, the question that will spring to the Albanian mind will be – Why trouble to have an independent Albania at all? Hoxha must prevent people from asking themselves that question, or his life would be short. Hence the propaganda against the Greeks, the vast mass of printed matter, the scrupulous respect for such symbols as the old flag. Hence, too, the attempt to raise feeling on Albania’s exclusion from the San Francisco Conference and the urgent pleas for recognition. Recognition would strengthen the Hoxha regime immensely, for without recognition, FNC will eventually be bound to acknowledge its present unrepresentative nature. Either it would try to consolidate itself by bringing Albania into the Jugoslav federation, and so provoke civil war. Or it would have to broaden the base of the Government and bring more moderates in it. For the present Government consists of ‘true blue’ Communists with a fringe of powerless and unrepresentative men as window-dressing. Real power lies in the hands of unscrupulous men like Koçi Xoxe, Minister of the Interior, and – perhaps to a lesser extent – Enver Hoxha himself. Most notable among the second group are Baba Faja, the Bektashi priest from Martenesh, and Myslim Peza, the courageous but illiterate guerrilla leader. They give an air of national unity to the Cabinet, being themselves far from Communism, but they are outside the main current of events and their importance lies in their nuisance value. Myslim Peza, for example, recently had the boldness to go into the witness box at the ‘War Criminals’ trials and testify in favour of Ibrahim Biçakiu, thus without doubt saving his life and securing for him a life sentence of imprisonment, which may be expected to be quashed when the Hoxha Government falls. Peza can afford to do this at present, but he will not be forgiven and it would never be surprising if he were to share the fate of Mustafa Gjinishi, a respected early Communist leader who was murdered during the struggle for power within the FNC. The latest story of Baba Faja is that he was so enraged during the Cabinet meeting that originally decided to reject ML and UNRRA that he drew his gun on the communist members. The Baba explained what seemed to him common sense, that since many Albanians wanted food and the Allies were ready to supply it, Albania should accept the offer. He was told that the people thought otherwise. He then challenged the Cabinet to disarm their forces, hold a free general election and see what happened to the Communist Party. In the argument that followed he brought out the gun, but as is fate, was too engrossed in noting what he was saying to see the weapon taken from him. To make peace again, it was decided that in future Ministers should not wear guns at Cabinet meetings. Myslim Peza, however, took the view that his opponents would not respect the agreement. So he decided not to attend any more Cabinet meetings, but to send along a deputy instead. Such are the men who rule Albania in the name of liberty and democracy and maintain their power with rifle and propaganda.